Ever since I installed Mavericks I’ve been plagued by a ridiculously annoying bug. Perhaps 5% of the time, when I open a new Finder window in list view, the name column is much wider than the finder window itself, rendering the other columns out-of-view. Intense searching and testing has provided no explanation or solution to this problem, I can only assume that is in fact a bug with Mavericks itself. The only decent fix I’ve seen is the full-screen toggle trick (hit ctrl + cmd + f, let it go into fullscreen, hit same keyboard shortcut to exit) which works, but is still quite slow and cumbersome. Holding down option while resizing does not work; that trick only works for column view but not for list view. After constantly getting frustrated by having to resize the columns manually 30 times a day, I decided enough was enough and it was time to create a fix for this once and for all. A bit of playing shows that Finder will fluidly adjust the column widths if all columns are in view. It’s only when the column widths exceed the window width (aka, when a horizontal scrollbar is visible) that the fluidity ceases to work. So I figured that if we simply resize the Finder window to a really large width to accommodate all columns, then back to its original size, we might be able to trigger the fluidity. And amazingly, we can. Open up AppleScript Editor and paste in the following script. 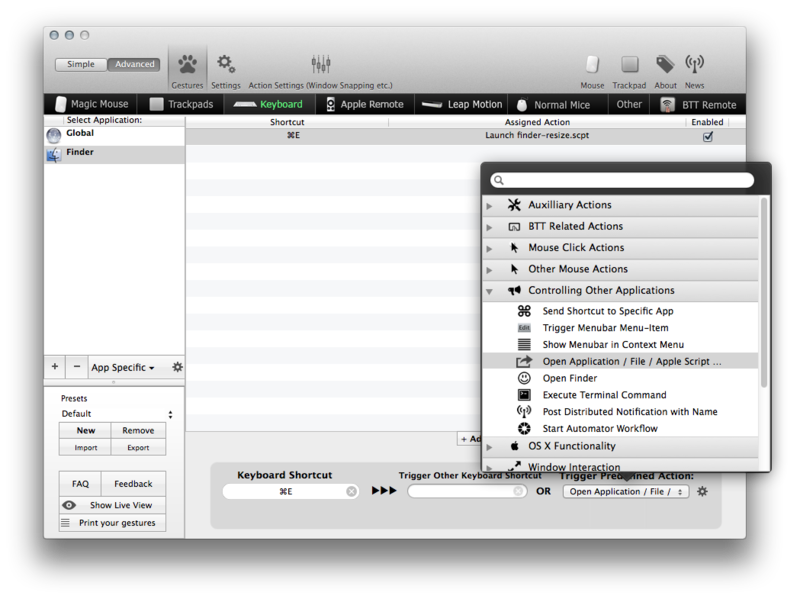 Then open up a Finder window, make the name column wider than the window (if it isn’t already), and run the script. It should quickly toggle the window size, resulting in the name column adjusting properly to the size of the window. There are 2 ways that you can trigger this script to run. The method that most people prefer involves saving the script as an application from the AppleScript Editor, then option + cmd dragging it onto the finder toolbar (thanks to the anonymous commenter who pointed this out). Jimmy Kuik has kindly provided an icon that you can use to make it look aesthetically pleasing, you can download it here. Alternatively, if you’re a power user, you may prefer a keyboard shortcut. The easiest way is to use a tool like BetterTouch Tool which allows you to create custom keyboard shortcuts (amongst many other useful features). Now, every time you open up a folder and the name column wigs out, just hit CMD + R and you’ll be good to go.